Learn how to make a Fresh Fruit Cake with whipped cream in an easy video tutorial manner in this post. 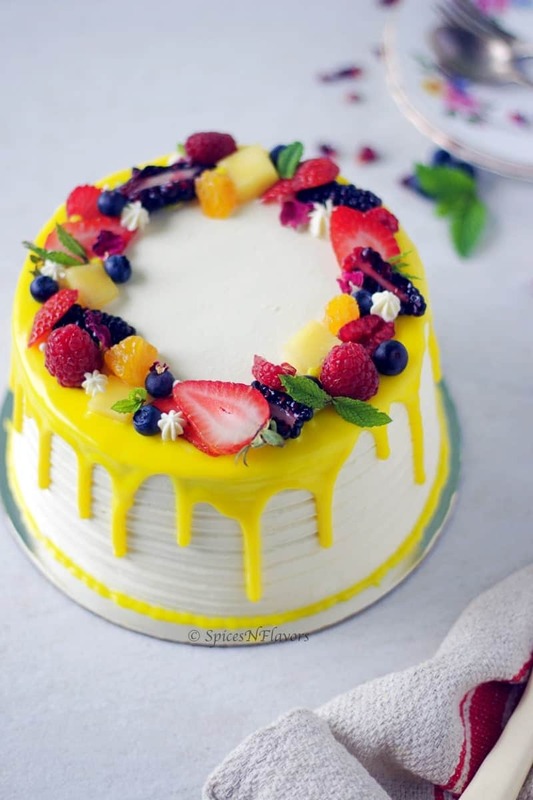 A simple, moist sponge cake layered with fresh cream and seasons fresh fruits this recipe is a must try this Summer. How beautiful does that fresh fruit drip cake decoration look!! 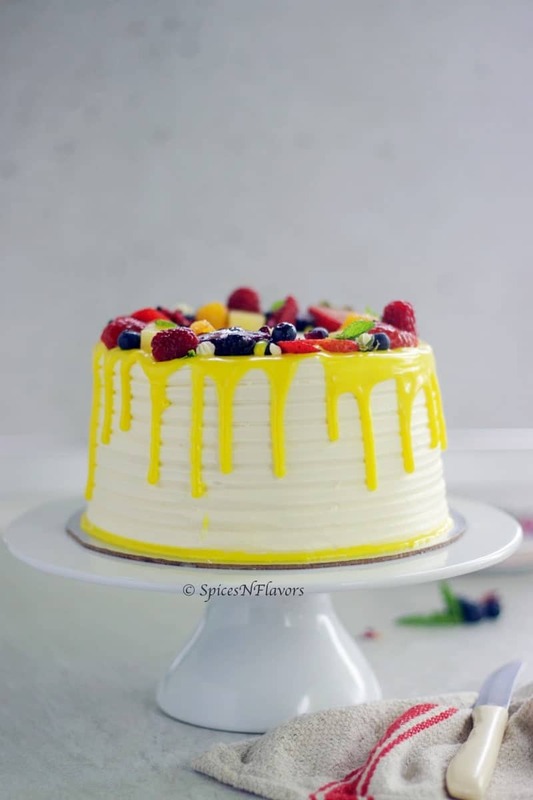 Fresh Fruit Cake adorned with that glowing drip and sparkling fresh berries was not only pleasing for my eyes but amazingly palatable to my taste buds too.. But Why should you choose this as your birthday fruit cake recipe? Soft and Spongy Eggless base – Of course you can choose a genoise sponge as a base too but once you taste it you would not believe that it is an eggless recipe. Easy and Simple to put together. 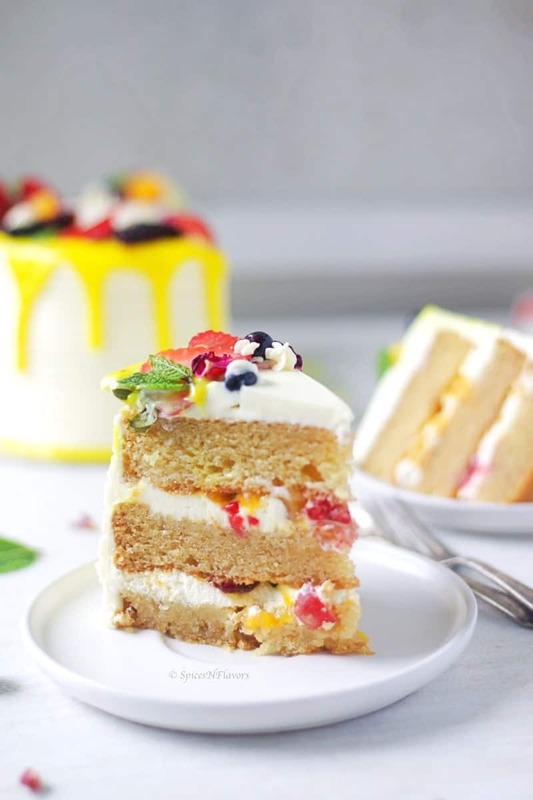 Some flavours are truly classic when it comes to making a birthday cake be it this real fruit cake recipe or Black Forest Cake, Pineapple Cake or Butterscotch Cake. One can never go wrong with these flavours right. You can use your favourite Vanilla or Chocolate cake recipe as the base. This time I have not used my favourite Eggless Vanilla Cake as the base. Instead, I have tweaked a few things in that recipe to make an entirely different cake base. Because that was a really basic recipe using just oil and water. Though I were satisfied completely with that recipe I had few of our readers doubting the same because of its simplicity. So I thought of making a few basic changes in that recipe and make an entirely new one for you guys. Have changed the quantity of water and used milk and yogurt in it. Also, have increased the amount of dry flour. This time the cake was super moist and soft comparatively. I guess it was due to the addition of yogurt. The only thing my cake turned little brown in colour. Still trying to figure out the reason for the same. However, I am totally satisfied with the recipe. 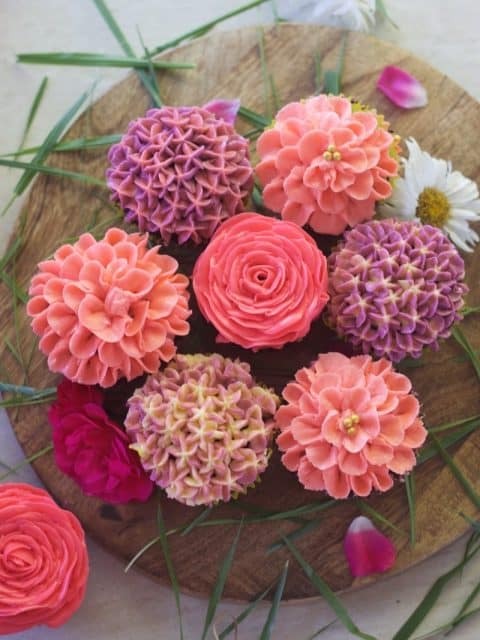 Will I use this recipe in my future cakes? Yes, definitely. It was totally worth it. You can also make cake base out of premix if you desire. It’s a child’s play to make sugar syrup. Simply combine equal portions of sugar and boiling water that’s it. That cloud like melt in your mouth frosting is to just die for!! This is totally optional. I have used a white chocolate ganache which is made of chocolate and cream just to enhance the look of the cake and colour to act as a contrast to the white cake and berries. To make fresh fruit cake you would obviously need fresh fruits right. Pineapple, Apples, Grapes, All kinds of berries, Mandarins, Oranges, Kiwi, Pomegranate, Apricots, Peaches, Mango etc. depending upon the availability of fresh fruits. What you are aiming for is good sturdy fruit. I tend to avoid soft, mushy and juicy fruits like watermelon, banana, etc in fruit cake with fresh fruit. I also tend to add dry fruits like cranberry or even nuts like almonds, pistachios etc which adds on to the texture. I for one do not make cakes with alcohol. But if you prefer while making the Fresh Fruit Cake recipe you can choose to soak the cake with alcohol. That way you would get an after taste of alcohol which I guess some of you would love. Generally speaking, the fruit-cakes made for Christmas is soaked in rum and hence it gets the name. But just like how we add alcohol while making black forest cake, one can definitely combine the flavours from alcohol in a fresh cream cake too. The only glitch is that, while making the sugar syrup you will have to boil the alcohol, sugar and water together until the sugar dissolves completely that way all the alcoholic content would be evaporated and what you would be left with is just the alcoholic flavour. Sift together the dry ingredients - Flour, Baking powder, Baking Soda, Salt and Sugar and keep aside. Take milk in a bowl. Whisking continuously add the oil to help it emulsify. Next, add the yogurt and essence and combine together. Divide the batter evenly between three 6 inch pans that have been greased with butter and lined with parchment paper. Approximately 275 gms in each tin. Bake in a preheated oven of 180°C for 35-45 mins or until a skewer inserted in the centre comes out clean. Demould onto a wire rack and allow it to cool completely. Take the sugar in a bowl and add the boiling hot water. Combine to dissolve the sugar and then give ample time to cool it completely. Better to leave it in the refrigerator until completely cooled. Take the measured out whipping cream, icing sugar and essence in a bowl. Whip until stiff peaks form and it is ready to use. Chop seasonal fruits of your choice into small bite size pieces. Whipping continuously add the whipping cream little by little. Scrape the bowl using a spatula and then add icing sugar and fruit essence. Whip until stiff peaks form. Layer the cake onto a cake board. Trim off the top to even the cake. Soak the cake with the prepared sugar syrup all throughout. Add half of the cream filling and spread it out evenly. Top with the mango passionfruit compote and fresh fruits of your choice. Place the other cake layer on top and repeat the steps. Crumb coat the cake with the leftover cream filling and let it chill for 30 mins. After 30 mins frost the cake completely with the stabilized whipped cream frosting till you get a smooth finish on the sides and top. Refer the video on how to frost your cake for a better understanding. Let it chill once again for 30 mins. Meanwhile, start preparing your Chocolate Ganache. Take the weighed out cream in a saucepan. Add the colour of your choice. Mix and heat it up until it just begins to boil. Add the hot cream on top of the chocolates and allow it to sit for a minute. Then stir to dissolve the chocolate completely until you get a smooth batter like consistency. Strain the ganache for an even smoother finish. Let it sit in the refrigerator for 10 mins until it thickens a bit. Take the chilled cake out of the refrigerator. Transfer the thickened ganache onto a parchment paper cone and start dripping around the sides of the cake. 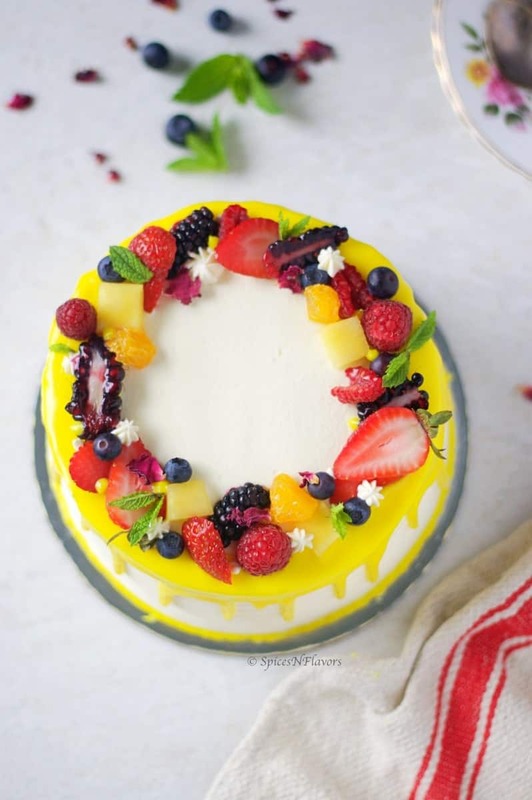 Allow it to set completely in the fridge and then add decorate the cake with fresh fruit on top for a perfect fruit cake decoration. If you do not have a fruit essence you can definitely use Vanilla Essence in place of it. I have used a store bought Mango and Passionfruit compote here since these fruits are not in season now. 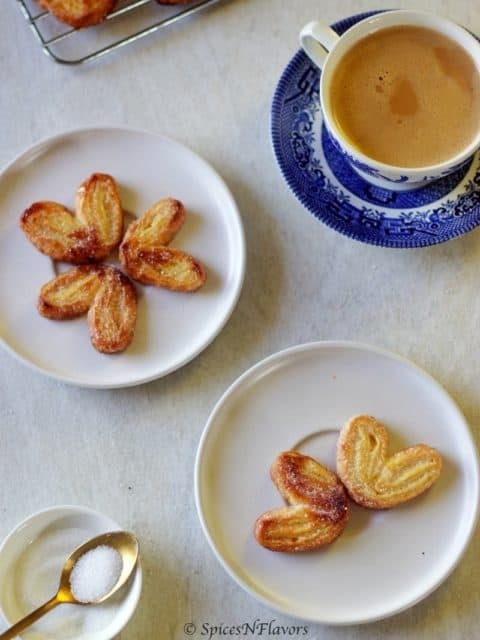 You can skip this completely or make your own by following this recipe. Simple replace blueberry with Mangoes. 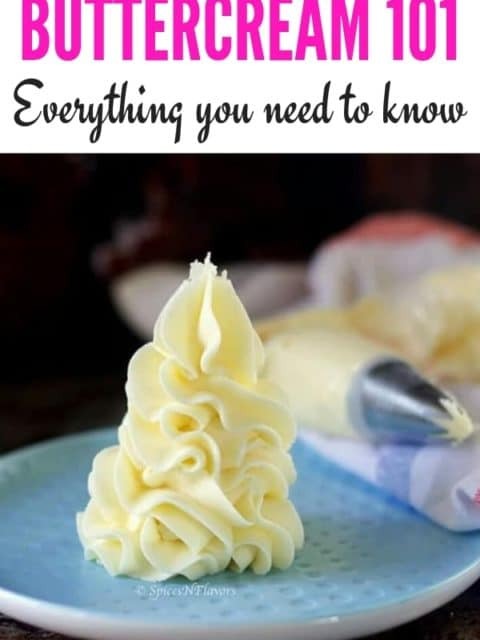 Simply follow my stabilized Whipped Cream frosting recipe for a much detailed recipe step to get the perfect smooth frosting. The cream cheese has to be softened and not melted. After weighing the cream cheese I simply microwave it for 10 sec and then proceed with the recipe. If you would like to know how to make your own parchment paper cone easily at home then definitely refer to this video on how to write on cakes for a detailed explanation. It is actually pretty simple. All you need to do is apply a glaze on top for which we will use Apricot Jam. If you start applying after it is cooled down then you might leave marks on top of the fruit so it is advisable to apply the glaze when it is still warm. How to Store this best fruit cake? Since we have made use of fresh cream in this recipe, definitely store this in the refrigerator only. 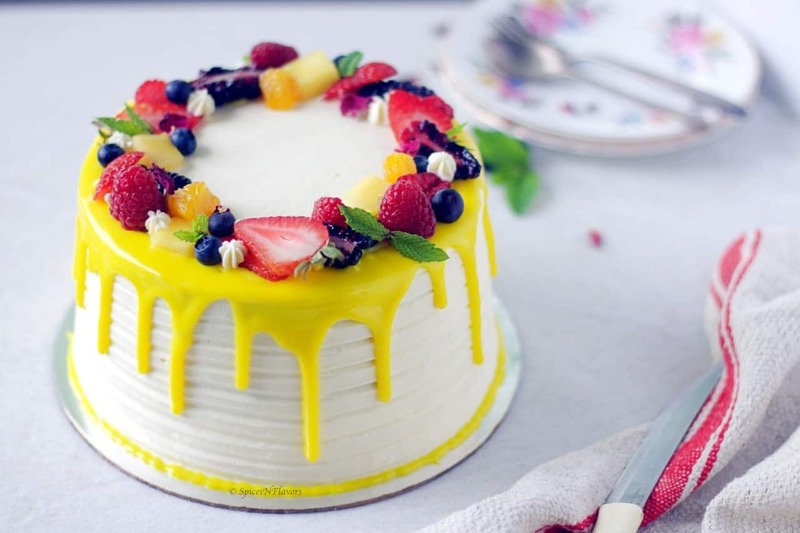 Apart from the list of fruits that can be used in baking fruit cake, I believe there is one more question that is most searched for or asked for which is Fresh Fruit Cake price. 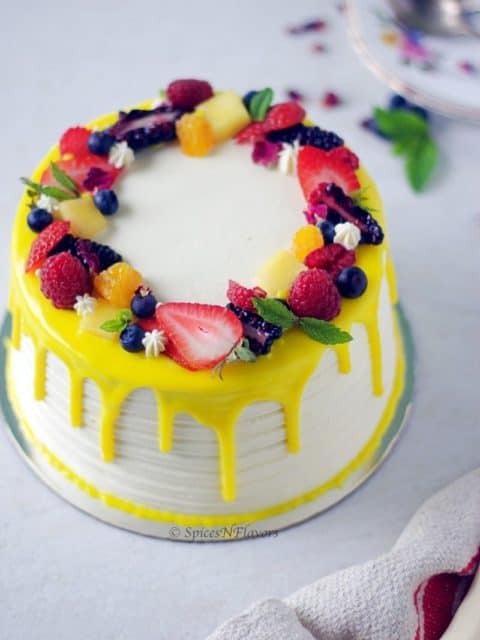 Usually, I do not talk about pricing of the cake in a post like this fruit cream cake. But I would like to take a moment here and discuss in brief or just touch this topic on pricing this delicious fruit cake. You have to take in to account the price of the fruit as per the season. Like, consider adding those fruits that are easily available whenever you are making this. You may think that’s common sense what so special about it? Well, what I wanted to convey is while pricing a cake made of fruit you have to consider the WASTAGE. For eg, if we take into consideration Grapes, for making this 6 inches Fresh Fruit Cake I have made use of a total of just 8 grapes. However, when you go to purchase the fruits the seller won’t give you just a handful of each fruit which means you would end up buying more fruits than what is actually required to make the cake. So it absolutely makes sense to add some Wastage charges onto the cake about which you can inform the client beforehand just to be clear with them. And do not miss to watch the Fresh Fruit Cake recipe video for a clear and detailed understanding. Consider checking this post on How to write on Cakes if you are a home baker or making a birthday cake for a near and dear one. Wishing myself a very Happy Birthday with this beautiful and classy looking very best fruit cake!!! hehe.. I know so cheesy but still, it is my birthday so let’s make some noise in the comments below..
Do share your thoughts with me on this cake with fresh fruit inside and outside. Would love to hear your thoughts on the same. 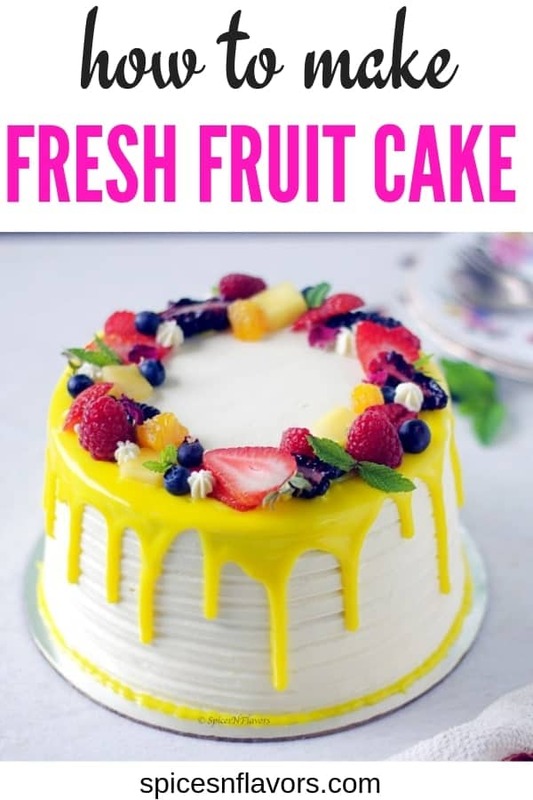 If you happen to recreate this cake or liked any of the idea mentioned in this easy moist fruit cake post then let me know by sending a message on Facebook, Twitter or Instagram. And yeah do not forget to Pin this onto your Cakes board in Pinterest. I will see you soon with yet another recipe. What a gorgeous looking cake!! Wishing you a very hsppy and healthy birthday! Enjoy!! Thank you so much Dhwani.. So good to know that you liked the cake.. Thanks for sharing your thoughts.. Such a gorgeous cake, Sushma 🙂 You’ve explained it so well for any amateur to re-create it at home. Belated birthday wishes to you! Thank you so much Freda for the wishes.. This recipe will not work with additional liquid ingredients.. If you wish to add more liquid then you will have to adjust the cream cheese quantity accordingly.. sorry about that..
Hope you try it again with the required changes. Wow what a well explained recipe! Very well explained with so many details. Thank you for sharing your knowledge. So glad to know that you found this informative.. thank you for sharing your thoughts.. really appreciate it..